Just about every building features some kind of iron ornamentation. Yet almost none is real wrought iron. Instead it is mass produced by factory assemblers. The result: designs and quality that can’t compare with the real thing. Iron Master Decor ranks among the only companies in North America employing fully qualified, professional blacksmiths. Master craftsman Joe Schneeberger apprenticed and worked with Austria’s leading wrought iron maker for 17 years before bringing his unique skills to Canada. He has passed this specialized knowledge on to his own trainees, including his son Mike Feiner. Mike also apprenticed in Austria in their family business dating back to 1906. Now he is teaching the techniques of yesterday, enhanced by the tools of tomorrow. Every Iron Master design is a handmade original. Every installation is a piece of living, lasting history. 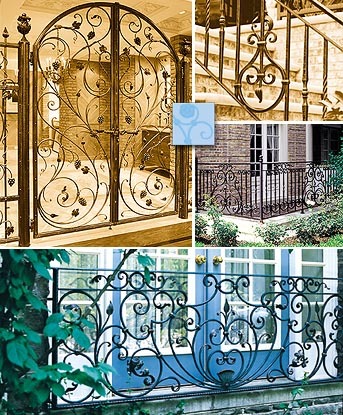 Creating ironwork that stands the test of time requires exacting attention to every last detail. Iron Master uses only those materials that meet the highest standards. This means every piece we create for exterior use must be hot-dip galvanized for total rust protection. Hot dipping coats the iron in liquid zinc, one of the most corrosion-resistant metals in existence. The zinc-galvanized pieces are then finished with an imported German paint specifically made for galvanized metals. This one-of-a-kind product ensures a lifetime of maintenance-free durability. On interior applications, we seal the ironwork with a crystal clear lacquer a finish that picks up and reflects the light, is easy to keep clean and never ages. We take pride in creating first impressions that last forever.